After the TAC Quick event yesterday, a couple of attendees decided dessert was in order, namely, pie. Thus my friend's idea of walking over to Pick Me Up Café for a nightcap, so to speak, gave me the idea to hold a long-overdue pie-off. Hopefully there aren't too many people who feel they can't do the LTH Picnic and a Pie-Off back to back! I was thinking we could share a few pieces rather than order individual slices per person. Unless there is a huge response, I'll cap the event at 10 since most of these places will likely be small. I was thinking of starting around 2pm. I like to sleep in. The joints are all listed in munchalogical order, so you can get your takeout pie right before you go home. Last edited by Pie Lady on January 12th, 2009, 3:07 pm, edited 9 times in total. Glenn's Diner is basically around the corner from First Slice. They serve Hoosier Mama pies. I love the idea of a pie-off. Unfortunately, since I'm taking the day off for the picnic the day before, it's very likely I'll have to work on the 7th. Eat some pie for me, too. Work, boo. I shall pie in your honor. I am sure you all get the DISH e-newsletter but this was today's quote....I of course thought of Pie Lady. I think Cafe Wicked is closed, may want to fit something else in that slot. Maybe Sweet Thang. Chloe54 wrote: I am sure you all get the DISH e-newsletter but this was today's quote....I of course thought of Pie Lady. Alrighty, I could use a list of people planning to come. I will be happy to join you. It will be interesting to see how people are doing with their pie. I was at American Depot Diner last night, which seems to make their pie on the premises. They reheated it in the microwave that didn't do wonders for the crust. Maybe next time I will order the pie immediately when I arrive, then have them take my slice immediately out of the refrigerator to get some warmth. Room temperature would have been much better for me as well as for the crust. Cathy2 wrote: Maybe next time I will order the pie immediately when I arrive, then have them take my slice immediately out of the refrigerator to get some warmth. Room temperature would have been much better for me as well as for the crust. That's a good plan, except ask them to warm the pie on the flat top. 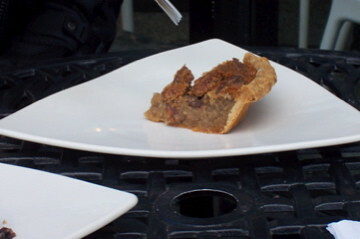 Cathy2 wrote: It will be interesting to see how people are doing with their pie. I was at American Depot Diner last night, which seems to make their pie on the premises. They reheated it in the microwave that didn't do wonders for the crust. Maybe next time I will order the pie immediately when I arrive, then have them take my slice immediately out of the refrigerator to get some warmth. Room temperature would have been much better for me as well as for the crust. It is amazing to me how many otherwise good places commit this horrendous sin. Microwaving pastry is, imo, on par with serving a caprese with tomatoes right out of the ice box. Maybe even worse. I completely forgot about an event I'm doing the night before. I'd really prefer a 2pm start. All right, youse, I'll be bringing some of my pals and we'll see you at 2 at Common Cup. Should I wear a rose on my lapel or something? I think I am the only 'youse' so far. I think we will figure it out. FWIW--I stopped into Pie for the first time this morning, and it looks like they have a seating area in the back. A group walked in just before I did and asked if they serve breakfast food. The person behind the counter then proceeded to walk them to a table in the rear of the space. I might make it (maybe +1?). Right now I am cooling a travesty of a strawberry pie - I failed to respect the tapioca, and the tapioca showed its displeasure. So anyway, my sad pile of sticky pearly goo is making me want the kind of pie I can actually eat. Just cover it with ice cream. Glad to have you join! Is it too late join in? I could go for some pie this afternoon! You are expected. To sweeten the deal, I have your backpack in my car. Octarine wrote: Is it too late join in? I could go for some pie this afternoon! Sorry, I'm just getting this now. Sure, you can come! We all were very impressed with the Peach and Blueberry since they were not only delicious, but they tasted like fruit, not just sugary confections. The Apple was also tasty but after all the pies of the day, deemed the least and a bit dry for some, do I have that right guys? Still, I would personally give the Apple a B+, Peach an A- and the Blueberry and A+. In fact, it was so good, it made me start believing again. I only had a tiny bite of the Pecan as I'm not a big fan (I find pecan pie as pointless as apricots! ) but perhaps someone else can weigh in? All the crusts were the same, and all the fruit pies had a nice crumbly topping - the brown sugar complimenting each one beautifully. All slices were only $2.95 too - cheap and yummy is always the best! The next stop was supposed to be First Slice, but when we got there, they were doing an emergency repair and were closed (!) but luckily Glenn's Diner (1820 W. Montrose) was only a short walk away and provided 3 Hoosier Mama's to satispie our demands. 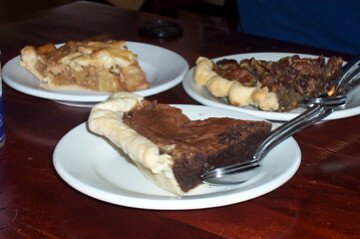 From left to right: Apple with caramel sauce, Chocolate Brownie, and Maple Pecan. This Apple pie was agreed to be the best of the day (of the apple pies.) The decadent, wonderfully heavy Chocolate Brownie was enough to satisfy any chocolate lover and came in a very flaky, light, unsweetened crust. I must say even the Maple Pecan was pretty darn tasty. Although all these slices were winners and rather sizeable, the price ($5.95) was not so nice. Third and last on the route was Sweet Mandy B's, an adorable little joint with old fashioned treats. I will definitely be back here for some cookies and cupcakes, but brother, don't go if you hate crowds. There were so many people crammed in there when we came it must have been a fire hazard. Seating is minimal and not very comfortable; when there's a lot of people in line, and I can imagine that's often, you constantly feel like you're in the way, even if you're sitting against the wall. This is a place that could benefit from some outdoor seating. Left to Right: Apple, Whoopie, Key Lime. This apple was reliably good. The whoopie pie reminded us of Suzy Q's or Ho Hos, but it was too ridiculously sweet for us. If they cut down the sugar to about half, I think it would have been a real treat. (We didn't quite finish that one. I'd give it a C). The Key Lime was the pie of contention: I thought it was heaven, Pie Dude thought it tasted like Pledge, and the other Pie-ers I believe were more on my side? The crust was the buttery crumb that should only accompany key lime (in my opinion). I also liked that it was topped (GENEROUSLY) with real whipped cream. Compiementary water & utensils were off to the side on a table that really could be taken out to accomodate more customers. The price at SMB's was the best for the quantity and quality - $11.20 for all three. After this, it was a little to late to go to Pie (615 N. State), but we were also on the verge of diabetic comas so we decided to call it a day and go home to nap instead. Thanks all for coming! Although I'm disappointed in your collective lack of pie-related puns. It was suggested that we have a sequel to pie day. I think that another one in spring might be nice, since the selection today clearly leaned towards autumnal flavors. Look for Pie Day 2: Electric Boogaloo coming soon! Tell your friends! From a technical and taste point of view, the Hoosier Mama pies were the very best for my tastes. At $4.95 a slice in a restaurant, it was also the most expensive pie of the day and well worth every penny. 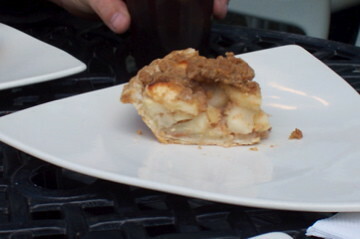 The apple pie was the only double-crust pie of all the slices tried today. The pie crusts were clearly handmade with different edging treatments for each pie. The brownie pie was heavy, dense chocolate that fixed people's chocolate craving. The apple pie's filling had enough sugar, cinnamon and nutmeg to compliment the apples. If I wanted just pie, then I would definitely go to Sweet Mandy B's for a reasonable costing slice for under $3. I am one who does not like their desserts undersweetened, though I don't want to go into sugar shock, either. The Whoopie Pie was considered too sweet by others and fine with me. If I were to quibble, I would prefer a much smaller portion, because this was at least 4-5 inches in diameter. A one-to-two bite portion would have served me well, though this kind of dessert is traditionally very sweet. The apple pie's crust also appeared handmade with a crumbly streusel topping that was fine, though not my favorite execution. The apple filling was full of fruit with enough sugar and spice to support the fruit. I was very pleased the Key Lime pie had real whipping cream and a modest amount of graham cracker crust, which I may imitate sometime. I am not a big citrus dessert fan, though it seemed to be a reasonable specimen of this type of pie. Of course, I like Limca, which others think tastes like Lemon Pledge, too! I was not impressed by the pies at The Common Cup. 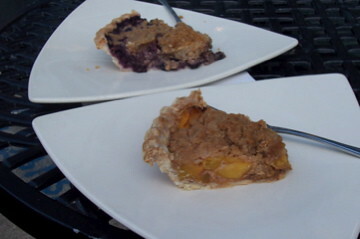 They seemed to use a premade shell, then finished every fruit pie had the same heavy, non-crumbly streusel filling. The apple pie filling was dry, undercooked and could have used more sugar, cinnamon and nutmeg. The total lack of juiciness in this pie made we wonder if there is such a thing as food service precut, pre-peeled apples to just mix into cakes or season for pies. I really found the lack of juiciness off putting. The pecan pie was just so-so especially when compared later to the Hoosier Mama's pecan pie. I found the blueberry and peach to taste a bit flat, but I was certainly alone in my opinion. On a sidebar note, I ordered a glass of whole milk at The Common Cup. The cost approached the same as my pie slice, which rivals the cost of a gallon of milk. When I asked how the milk was priced, I was advised they selected the code for steamed milk. If I were not so strongly desiring a glass of milk at the moment, I might have taken a pass. While we may differ in our opinions of these pies. Certainly there are better efforts being made presently to get a better pie slice out there. I hope sometime we may cover those two places we bypassed and maybe hit American Diner for their pie as well. Pie Lady, thank you for efforts to organize this. It gave me something to refreshen my mental batteries. Don't worry, American Diner and Medici on 57th (assuming they are still around next spring) are on the Pie 2 list. Maybe we can hit up the south side for some peach cobbler too. Pie Lady wrote: Don't worry, American Diner and Medici on 57th (assuming they are still around next spring) are on the Pie 2 list. Maybe we can hit up the south side for some peach cobbler too. If you're going south, don't forget Miss Lee's for pecan and/or milk pie. Ordering pie through bullet proof glass is an odd, but rewarding experience. (Don't forget the peach cobbler). Can you eat in there, or is it a takeout place? Pie Lady wrote: Can you eat in there, or is it a takeout place? Take out only. Food from Miss Lee's is traditionally eaten al trunko. Locked in, or sitting on top? I'll have to try this place. It will be my first bulletproof pie. 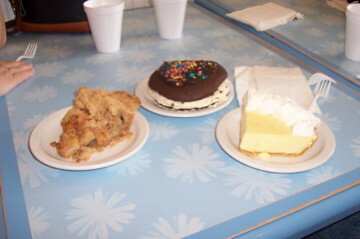 Pie Lady wrote: Although all these slices were winners and rather sizeable, the price ($5.95) was not so nice. FYI, Hoosier Mama pies are $3.75 at Metropolis, not that far from Glenn's. I would love to invite everyone over for pie so we can have a pie discussion. If we do it in the evening we could get chairs around the work bench and I could bake some pies off right before you come. Let me know if that would be of interest.